When I received my first Zalora purchased, I found a Hari Raya Aidilfitri voucher from Zalora which worth RM 25. However it’s for first time buyer, therefore I’m not eligible to redeem it. 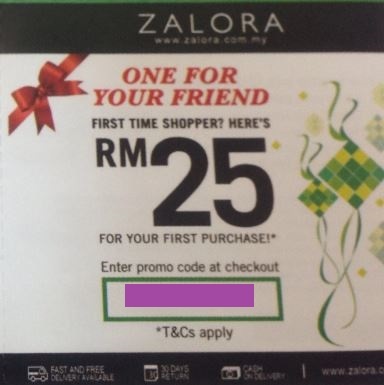 So I decided to giveaway this RM 25 Zalora voucher to one lucky reader here. Please keep in mind that, this voucher is for the FIRST time buyer, if you’re currently having an account, or have made any purchased before, you’re not eligible to use this voucher. 1. Minimum purchase of RM 99 and above. 2. Not valid for marketplace items or use along with other promo codes. 3. Valid until 15th August 2014. 4. If final paid price (after RM 25 discount) is equal or more than RM 75, you can enjoy free delivery. To be one of the lucky winner, just simply leave your comment here or our facebook fan page. Contest will be ended at 10th July 2014, and winner will be announced on 11th July 2014. Don’t forget to click the share button to share to your friends. p/s: If you have a lots of fashion want to buy at Zalora, and total price is more than RM 200, you can use this voucher code to save 15% on your first purchase, which is more than RM 25. – For first time buyer and no expiry date. You’ll be contacted via Facebook private message for the voucher code redemption.